Time until Mystic Riders release day! Mystic Riders is a 2D side-scrolling shoot'em up game set in a fantasy world, similar in style to Cotton. 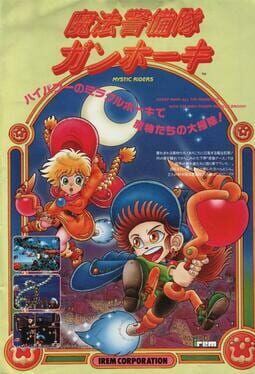 The player controls a child witch riding on a broomstick. Gameplay is very typical - the player flies right, shoots enemies like ghosts, grim reapers, bats, dragons, gargoyles etc., and collects bonuses and power-ups. The witch can charge shoot to deal more damage. The game has six levels and a multiplayer mode for 2 players.